Seven people have died and dozens more have been injured after a tram overturned in London. People were trapped inside and more than 50 were taken to hospital after the derailment in Croydon just after 06:00 GMT. The tram driver, 42, from Beckenham, has been arrested on suspicion of manslaughter. British Transport Police said they were investigating whether he fell asleep. 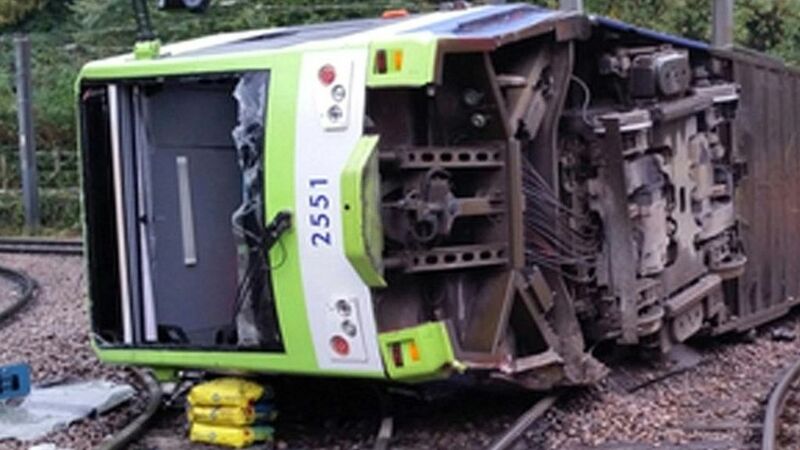 The Rail Accident Investigation Branch (RAIB) said the tram was travelling at a 'significantly higher speed than is permitted'. Seven people die, 51 are hurt, and a driver is arrested after a tram derails in London, police say. A no 3 tram for New Addington photographed at East Croydon on 25 September. Part of the former through platform 10 on the east side of Wimbledon station on 3 July 2004. The south end of the platform now forms the western terminus of the Tramlink network. Waiting to depart on 3 July 2004 is service no 2, destined for Beckenham Junction via Croydon and formed by unit 2534.